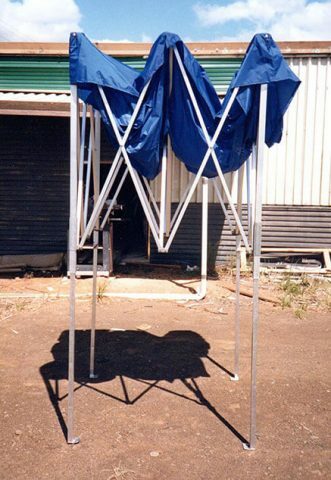 A little about QuikShade - It all began in 1985, an Australian company making high-quality pop up tents and gazebos. Ian McKinnon made the first prototype, and the patent applied for in 1987. From a factory in Casino, in the Northern Rivers in New South Wales, the frames are constructed by hand from Australian aluminium. Furthermore, the Company uses locally produced nylon brackets, and almost every hole is hand drilled. The process has steadily progressed over the last 30 years, and we now use a pneumatic drill press to drill the holes in the roof struts. Many other components are still finished by hand – Australian hands! So much today is produced in mass, by robots, or imported from cheap labour countries where quality standards may not be 100%. 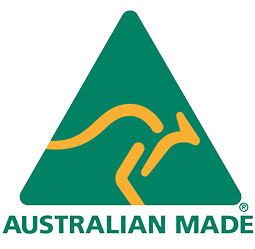 Therefore, it's refreshing to know that there are still people here in Australia who take pride in their work and apply their skills to produce a top quality product. Let’s meet some of those Australian workers hands! Wal has been working for QuikShade since 2000. With over 16 years experience with QuikShade frames, he knows the quality that is expected to bear the name QuikShade. Wal has seen more than half of all the QuikShade frames ever built. His attention to detail and also the high standard of his work ensures that the frames today are as good, if not better than those made over 20 years ago. Some of those old frames are still in use today! From receiving the delivery of aluminium from Brisbane, Wal checks the quantity and quality of every piece that passes through his hands. If it fails the “Wal Test” because it has a small mark, then it may be good enough for a “seconds frame”. Also, if it's 3mm too short he simply won’t use it! Wal is a man who cares about quality, and the reputation of QuikShade has always been for our high-quality products to last a lifetime. In the photo, Wal is fixing in place the 50mm bolt and washer set on a pair of pro strut (there are 12 pairs of struts in a 3m QuikShade frame). On each end of each strut he fits a 40mm bolt and washer set, this he will complete once the frame is assembled. 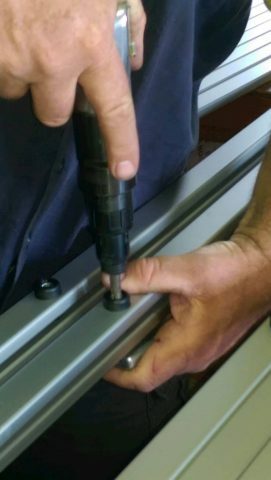 Each and every 40mm bolt is checked by hand for tightness. 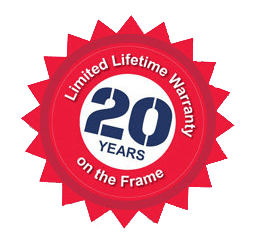 Too tight or too loose, and the frame will be harder to put up, getting it just right is crucial, Once the frame is "just right" it will operate correctly for 20 years or more. Ann started working at QuikShade in 2002. With many years of experience in fabrics and fabric construction, her exceptional experience is vital to QuikShade. Over the years since Ann first joined QuikShade, there have been many changes in the types of fabrics and threads available. Some of the threads we once used came from the UK. Sadly the industry over there has declined, and those products are no longer available. Many new threads are polyester based, but with the Australian climate, we need a thread that is also UV resistant. Natural threads which are cotton based we did use at one time when sewing canvas type materials, but they tended to swell. We have recently imported from America a thread which is both strong, UV resistant, and also anti-wicking. Additionally, we have returned to the way some seams made over 25 years ago use to be, but now we treat every stitch hole with a Poly-vinyl sealant. The cover fabric used today is 500 denier PVC coated polyester. Also, this fabric provides 98% protection from UV and is waterproof. Furthermore, it's less inclined to shrink; the natural fibres used before tended almost always to shrink. 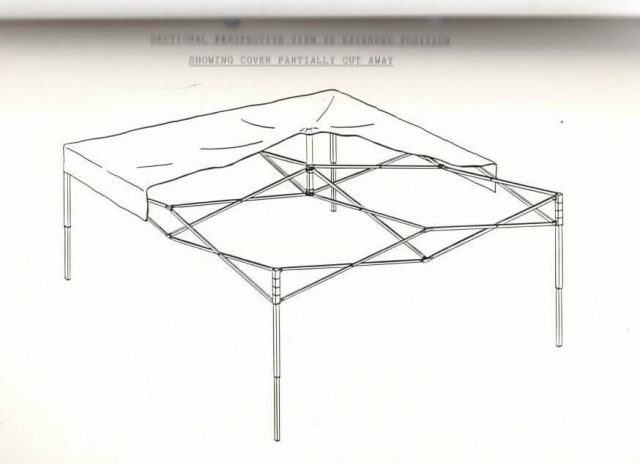 A QuikShade cover is designed to be quite a tight fit; this assists in rain runoff from the higher peak in the frame. Reinforcing patches are applied in the peaks and also wherever a stainless steel press button is attached. Ann continues to show pride in her work. If you find a QuikShade label inside your cover with AS on the back, these are the hands that made it! 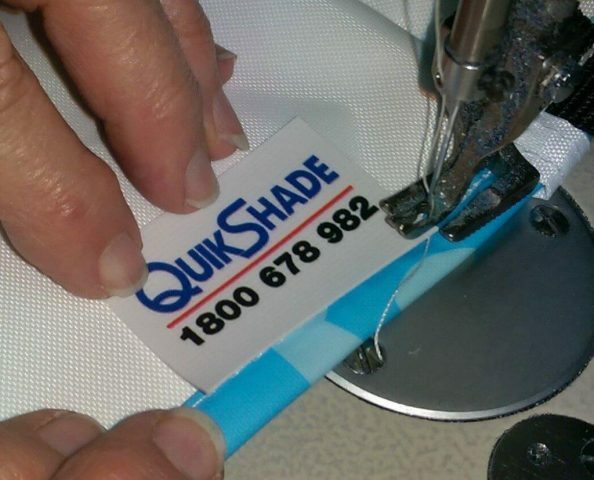 Ann is also the person who prepares designs and templates for custom sewing services available from QuikShade. 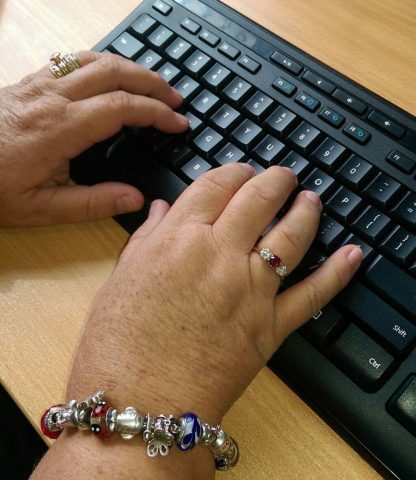 Ann cares about her work and ultimately the end user - YOU! Lesley is my wife, born and bred in Casino, NSW. Lesley manages the sales office and is in charge of the sales team, dealing with the many inquiries that come in each day. Her day is continually busy, responding to emails, telephone calls, faxes and yes we still even get the occasional letter! From an initial inquiry, through to a quote and preparation of artwork by our graphics designer, Lesley has it covered. Her multitasking skills include sending emails, complimentary artwork proofs, redrawn logos and information to clients. Also, collecting payments, putting orders into production, checking on deadlines and production schedules. A day that is often non-stop from start to finish. 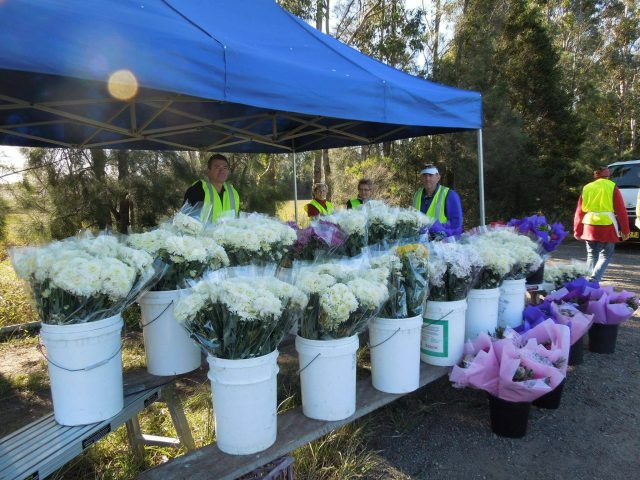 Lesley has always worked in an environment where the customer comes first. Therefore, she is always mindful of the extensive amount of experience that we have through people like Wal and Ann. Lesley values their expertise and often seeks their opinion in the best way to produce an item that a particular customer requires. Each client we have is important, and each job has its own requirements. These hands are the ones that take care of your inquiry. QuikShade has been a great product for over 30 years, from the prototype in 1985 through to today and into the future. 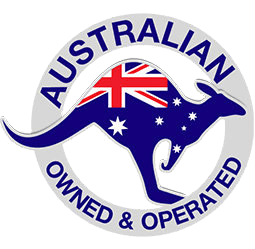 Australian hands will continue to produce QuikShade frames, covers and other custom sewing projects for Australians and Australian Clubs, Organisations and Companies. 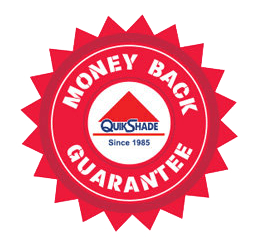 The list of customers that QuikShade have supplied over the years seems endless. If you name a large organisation, company, government department, charity, type of sport, QuikShade at some point have no doubt supplied to them. My name is Jeremy, and I am the Director of QuikShade. At QuikShade I have a great team of caring employees. Their friendship, support and continuous hard work I value immensely. We work well together, and are all important "cogs" in the significant QuikShade wheel! We are an accomplished business, proficient in what we do. 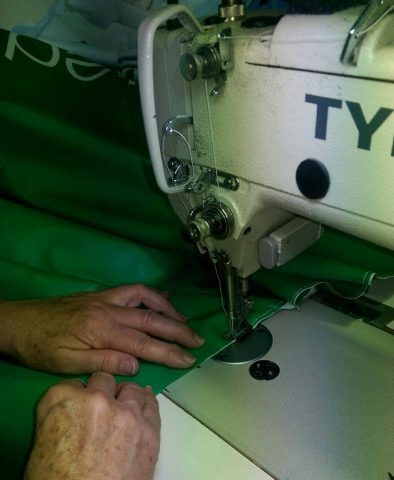 Our products are of the highest quality and produced by skilful people. 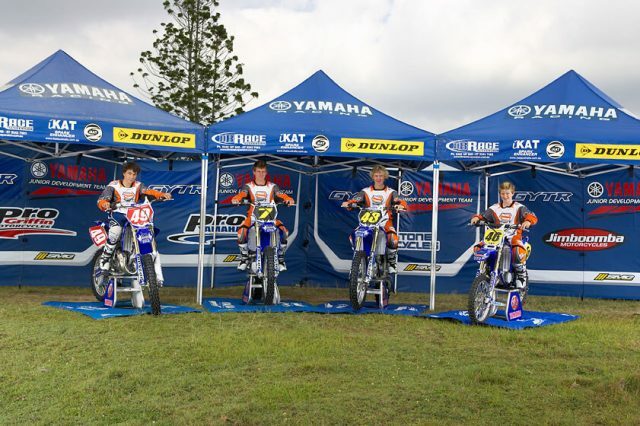 It's all about QuikShade producing what clients want! Let our friendly staff call you.